AutoCorrect is used to have Excel (or any other Office product) automatically correct the spelling of a word, abbreviation, phrase, etc. 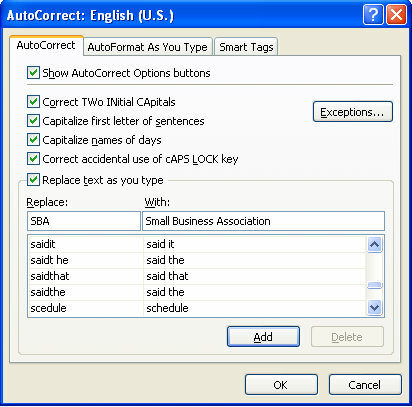 AutoCorrect can be accessed by selecting the Office button, Excel Options, and Proofing. AutoCorrect can be found by selecting the Office button and select Excel Options. Next select, Proofing (on the left) and you can now see AutoCorrect Options. You want Excel to type Small Business Association whenever you type SBA. 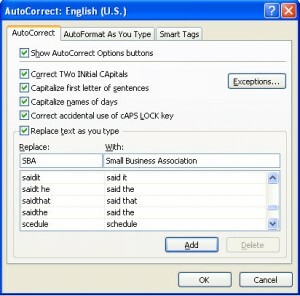 To do this, Open AutoCorrect and type SBA in the replace box and Small Business Association in the with box. Select Add. Click OK and you are done! You want to Excel to replace Ano with Añ0. The easiest way to get this is to insert the special ñ using Microsoft Word. (Yes I said Microsoft Word). Once you have the word spelled the way you want, highlight the newly spelled word with the symbol included. Open AutoCorrect using the same procedure as Excel, and you will see that the With portion is already filled in. Put Ano in the Replace field, select Add, and click on OK. You are done! AutoCorrect can save you time when you have to type in repetitive data for your business. Most cell phones have this feature available for text messaging as well.